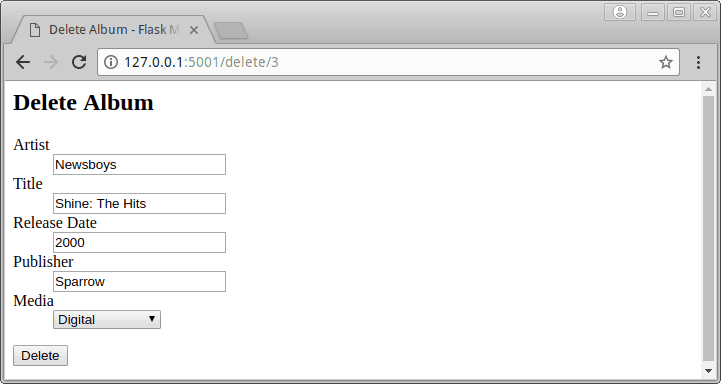 To end this series on creating a basic web app using Python's Flask framework, we take a look at taking a search and filtering and deleting the data that's returned. Here we added a somewhat lengthy conditional if statement. We first check to see if the user has entered a search string in the search text box. If so, then we check to see which filter the user has chosen from the combobox: Artist, Album, or Publisher. Depending on the user’s choice, we create a custom SQLAlchemy query. If the user doesn’t enter a search term or if our web application gets confused and doesn’t recognize the user’s filter choice, then we do a query against the full database. This is something that probably shouldn’t be done in production as, if the database gets really large, then doing a query against your database will end up making your web application unresponsive. You can simply add some validation to your form’s input to prevent this from happening (i.e. don’t query the database with an empty search string). However, we won’t be covering that here. Anyway, go ahead and try this code out and see how it works. I tried several different search terms and it seemed to work fine for my use cases. You will note that I simply used the contains method which is great for looking up a string in a table’s column. You can always index your database and do other various optimizations to it including making these queries a lot more focused if you want to. Feel free to play around with this code and see how you can improve it. Now we will move on and learn how to delete items from the database! This code is actually pretty similar to our edit() function from the last article. You will note that we updated the route though. So instead of specifying ‘/item/‘, we made it ‘/delete/‘. This makes the URLs between the two functions different so they actually execute the correct function when the link is clicked on. The other difference is that we don’t need to create a special saving function here. We just reference the db_session object directly and tell it to remove the album if it’s found in the database and then commit our changes. Now you should know how to do some basic filtering of search results from the database. You also have learned how to successfully delete items from the database in your Flask application. There are several places in the code that could use a refactoring and general cleanup. You could also add some CSS styling to your application to make it look prettier. Those are exercises that I will leave for the reader. Have fun playing around with the code and giving Flask a try. It’s a neat little web framework and well worth a look!